The painting depicts a scene that's familiar to all who travel up Boonton's curving Main Street. The red brick, wedge-shaped, "flatiron" building that dominates the center of the picture is something you'll see driving through the business district of this Morris County town, as are the bay windows of the buildings to the left where Plane Street angles off to one side, or the three-story structure in brownish brick to the right that over the years has held antiques stores, a bakery and other shops. The view of Boonton's Main Street in the 1930s. Even though the trolley stopped running in 1928, the tracks remained for a number of years. But a closer inspection reveals a Boonton that's no longer there. A high-rise apartment building would now dominate the view up Plane Street from the spot depicted in the painting. The Victorian era Methodist church visible in the background, as well as the stores next to it, were razed in the 1970s for a new post office. And Main Street itself is shown paved in red brick, with trolley tracks running down the center. The painting harkens back to the 1930s when three friends were growing up in this town perched on a hill above the Rockaway River. And it also speaks to the friendship that still endures between the three octogenarians — one who painted the scene, and the other two who continue to encourage his creativity. The Maxfield Fire House was Boonton's first firehouse, holding horse-drawn apparatus and later motorized trucks. 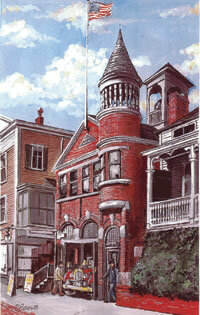 The 1890s building also served as the town hall, police department and courtroom, and while the facade was modernized to create a storefront in the 1970s, the jail cell remains upstairs. The image is on the cover of The Artistry of Bob Bogue, a book containing 38 of Bogue's paintings of scenes around the Town of Boonton and Boonton Township, as well as commentary and reminiscences by A. Lloyd Charlton, who compiled and published the collection. Bogue, Charlton and Don Estler grew up on the same block of Schultz Street (later renamed West Main Street) in Boonton, and shared memories of attending local schools, going to the movies, and stopping at The Kozy Korner ice-cream shop. After high school, Bogue studied for two years at the Commercial Illustration Studio in New York City, where he honed a talent he used in his career in advertising. He also continued to paint as a hobby. Bogue and his family moved to North Carolina in 1972, and about twenty years ago, he sent prints of two of his paintings to Charlton. One was the view of lower Main Street as he remembered it from their shared youth. The other, of Boonton's First Presbyterian Church, was for Charlton's mother, who was 90 at the time. 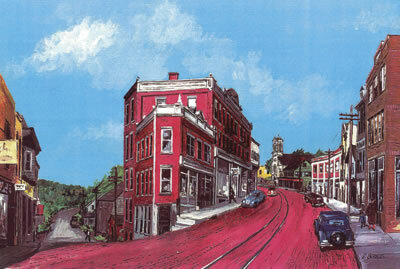 In 2000, Charlton contacted Bogue and asked him to paint depictions of the home on Schultz Street where he grew up, and the Cornelia Street home where he has lived since 1963. "Since Bob had fond memories of his childhood in Boonton and his married life in Boonton Township, he was willing to get out the paint brushes and do more than 15 new paintings," Charlton remembers. Boonton's Plane Street takes its name from Morris Canal Inclined Plane No. 7 East, which allowed for a difference of 80 feet in elevation between sections of the canal as it ran through the hillside town. Remnants of the plane are still visible just to the side of the street. Some were of homes and other scenes Bogue recalled from his years in the area. There's the movie theater—originally built for vaudeville in 1919—and the stone arch bridge over the Rockaway River, both of which still stand today. Another was of the Kozy Korner, replaced years ago by a gas station. Others were of local scenes that predate Bogue, Charlton and Estler, and are painted from old photographs and postcards. 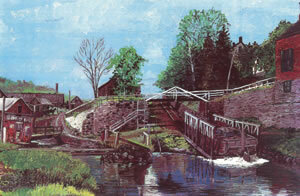 Several depict the Morris Canal, another is of the ironworks that owed its prosperity to the canal. In 2007, Charlton and Estler, both members of the Boonton Historical Society, decided to assemble an exhibit of Bogue's paintings to display in the society's museum. 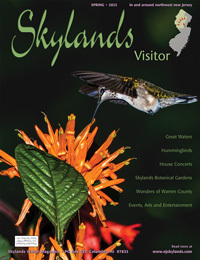 And last year, Charlton and his wife, Terry, compiled the paintings into a book, which is available on Amazon.com and at the historical society museum, located at 210 Main Street and open 1-4 p.m. each Saturday.